A trio of new Expedition 42 crew members is in its final preparations before Sunday’s launch and six-hour ride aboard a Soyuz TMA-15M spacecraft to the International Space Station. 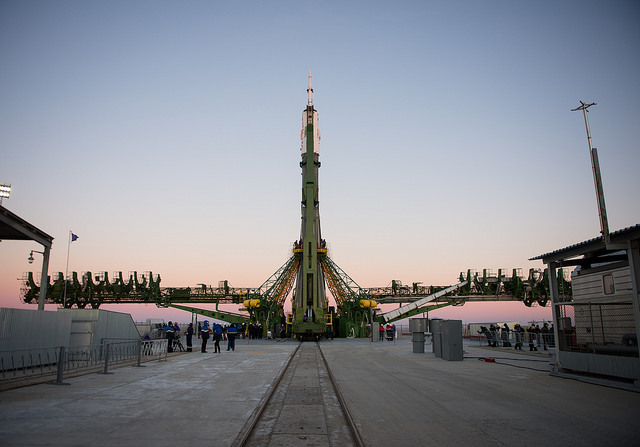 The rocket with the Soyuz capsule rolled out to the launch pad Friday morning at the Baikonur Cosmodrome in Kazakhstan. Aboard the station, Expedition 42 commander Barry “Butch” Wilmore worked on a plant growth experiment and continued calibration tests of the station’s new 3D printer. He also took some time out of his busy schedule to speak with ESPN Radio, giving them a look at life on the International Space Station. Willmore’s fellow crew members, Flight Engineers Alexander Samokutyaev and Elena Serova, worked on routine maintenance tasks and cargo transfers in the station’s Russian segment. Serova also conducted a test of the Russian segment’s computer network system.